For the second year running, the Motor Trend team is back at the Vandenberg Air Force Base, using its three-mile runway - once used to land the Space Shuttle - for a massive drag race. A hugely impressive roster of cars is present for the race, resulting in a list that looks like a Forza car pack. But bigger. And without the pointless appearance of a Honda minivan. 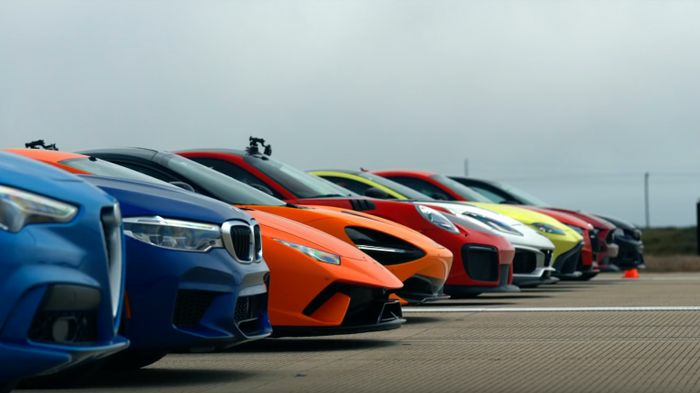 There’s also a half-mile battle with some omissions and interesting substitutions, although the viewing of that requires Motor Trend On Demand access, should you want to check out that race. As for the quarter-mile run, there are a few things we need to talk about, so there are a few spoilers the other side of this image. The 720S taking the victory should come as a surprise, but we didn’t expect the GT2 RS and Performante to be quite so close behind. The BMW M5 was hugely impressive meanwhile, finishing a mere three tenths behind the Corvette ZR1.